There is a spurt in number of e-commerce companies that have come up in the retail market offering various concessions and discounts. With a large and still growing base of internet users, the market for e-commerce companies is huge. Whether the discounts they offer are healthy for market practices has become the debatable issue. Many B-schools have included this topic in their Group Discussion (GD) round for MBA admission 2017-19. You need to know the key points of discussion on the issue. Electronic Commerce known as E-commerce means trading in products or services using computer network like Internet. It is the on-line marketing system instead of physical involvement of intermediaries like wholesalers, retailers before reaching the end user. The number of Internet users in India is 450 million. This number was 432 million in December 2016, a report from the Internet and Mobile Association of India and market research firm IMRB International has revealed. Although penetration of e-commerce in India is low as compared to markets like the USA and UK but is growing at a much faster rate with a large number of new entrants. India’s e-commerce market is expected to touch USD 28 billion in 2019-20 due to rise in large number online buyers. Buyer penetration is also expected to increase from present 12% to 18% by 2020. Overall e-commerce market is expected to reach Rs 150000 crores by the year 2020 with both online travel and e-tailing contributing equally. Some of the prominent names in the Indian E-commerce Industry are Flipkart, Jabong, Myntra, Snapdeal, Amazon, eBay, Homeshop18, Tradus etc. As the E-commerce market in India is small and good number of E-commerce companies available, there is a tough competition among them. For this reason many of the e-tailers have to close or have to change their business model for their survival. Recently, many of the E-commerce companies have adopted the unrealistic pricing to sell their goods into the market and to attract a large customer base. Under this unrealistic pricing the e-tailers are selling their goods at unexpected high discounts than in any retail store. This is definitely hurting the sale of the retailers who are investing and not meeting their sales target. Flipkart, an Indian E-commerce giant offered unrealistic discounts on the Flipkart’s Big Billion Day sale and claimed the business of Rs. 600 crores on that day. Snapdeal also announced similar sale. These types of unrealistic offers at heavy discounts attract a large mass of people and thereby contribute in the revenue generation of the company. The unrealistic pricing is benefitting the organisation and the customers who get the products at a very low price due to heavy discounts. But when the whole system is considered, it is eating up the cash flow into the Indian physical market. 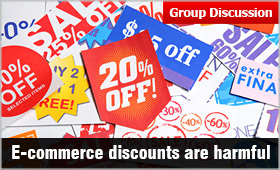 With the kind of prices E-commerce Company is offering, it is impossible for retailers to compete. The economy set up of India is presently running on these physical market rather than E-commerce market as of in USA and UK. Even after such tremendous growth of E-commerce in India, nearly 95 percent of business is still generated by offline retailers. The unrealistic price not only affects the small retailers but also hinders the growth of the Indian economy. The other disadvantage of the unrealistic low price offered by E-commerce companies is adversely affecting the Brand Name and Brand Image of the products in customer’s eyes. Since the e-tailing companies are using the unrealistic pricing strategy many of the brands have decided to be away from the e-commerce companies. The issue that arises is the warranty and the guarantee on the purchase of the electronics goods through e-tailing. The e-commerce companies do not have any physical store as available with the normal retailers where the customers can go and ask for the repair or replacement, the customers sometimes have to face loss also. Keeping in view the Indian market structure which has 95 per cent of the sales done through physical retail, the unrealistic pricing will deteriorate the retailers and therefore needs to be stopped for the better functioning of the Indian economy. The excess of everything is harmful. Although there should be the growth of e-commerce sector in India as the technology advancement is high, but this should be done in the umbrella of norms and regulations. The controlled e-commerce market will prove a boon to the economy but an uncontrolled market may go berserk and will prove to be a bane that will hinder the growth of country.